The role of the smartphone on the digital battlefield. U.S. military researches have awarded the first of what may be several contracts aimed at placing the right mobile software applications into the hands of warfighters for use on rugged smartphones and tablet computers. Officials of the U.S. Defense Advanced Research Projects Agency (DARPA) in Arlington, Va., awarded a $29.2 million contract last Thursday to GXM Consulting LLC in Ashburn, Va., in the first of several contracts expected for the DARPA Transformative Apps program. Transformative Apps seeks to develop a military mobile apps marketplace to make new capabilities available for use in the field. Ultimately the program seeks to move the resulting systems to the end users in the military services, and nurture a new model for acquiring, introducing, maintaining, and enhancing software, DARPA officials say. Some DARPA Transformative Apps technology has been tested in the field in Afghanistan, and DARPA officials hope to make more widespread deployments and create a broader selection of apps. Although today’s military handheld computers and networks are robust and secure, they also are fairly inflexible and costly, DARPA officials explain. New applications, and modifications to existing applications, can take years to field. Development is hampered by tight integration of hardware and software that often is generations behind commercial technology. Further complicating matters is the standard Pentagon practice to segregate users, requirements, and procurement in a process that does not respond quickly to rapidly changing user needs. Transformative Apps builds on commercial practices to produce secure, affordable, and rapidly deployable solutions for the warfighters, capitalizing on existing commercial smartphones and tablet computers for initial development and evaluations. Ultimately, DARPA officials want to help make handheld devices and apps broadly available to the lowest military echelons through a centralized marketplace for military apps that meet the evolving requirements of the battlefield. DARPA researchers envision at least two apps repositories — one with beta apps for initial app evaluations, and another repository with apps that have been vetted, certified, and approved for use. Part of the program’s focus on creating a military apps marketplace involves exploring new business models that lower existing barriers to entry, such as long proposal writing and cumbersome military contracting procedures. DARPA researchers want broad participation from many development teams, and are considering rewards for developers based on number of downloads, usage statistics, or other measures of value. 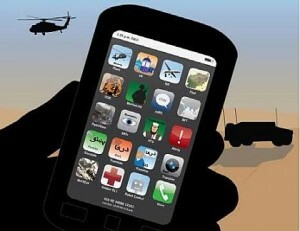 Apps will fill diverse needs of the tactical battlefield, including humanitarian missions, disaster recovery, command and control, reporting, mission planning, intelligence, surveillance, reconnaissance, real-time collaboration, geospatial visualization, analysis, language translation, training, and logistics tracking. The program targets the Android operating system, with emphasis on user interfaces, usability, simplicity, and ease-of-use. Some apps will function without network access, while others may require more consistent network connectivity. For apps that rely heavily on network connectivity, DARPA is emphasizing minimal bandwidth consumption and application robustness in spite of frequent network disconnection. The program will involve middleware and libraries to help share capabilities and accelerate app development. Examples technologies include map viewing, time services, data synchronization, speech recognition, information assurance, peer-to-peer services, and apps management. Of particular importance for the DARPA Transformative Apps program are middleware and tools to enable secure and reliable operation of apps on tactical networks in spite of limited backend computing and storage. The program also seeks to develop an affordable and secure mobile tactical network compatible with commercial smartphones. Also part of the program are vulnerability analysis and security architecture. GXM Consulting LLC will do the work in Ashburn, Va., and Afghanistan, and should be finished by April 2014.